Willa Sibert Cather (7 December 1873 – 24 April 1947) is among the most eminent American authors, known for her depictions of US life in her novels. There's nothing so dangerous as sitting still. You've only got one life, one youth, and you can let it slip through your fingers if you want to; nothing easier. Most people do that. Beautiful women, whose beauty meant more than it said... was their brilliancy always fed by something coarse and concealed? Was that their secret? He had seen the end of an era, the sunset of the pioneer. He had come upon it when already its glory was nearly spent. So in the buffalo times a traveller used to come upon the embers of a hunter's fire on the prairies, after the hunter was up and gone; the coals would be trampled out, but the ground was warm, and the flattened grass where he had slept and where his pony had grazed, told the story. My familiar spirit is like an old wild turkey that forsakes a feeding ground as soon as it sees tracks of people-especially if the people are readers, book-buyers. It's a crafty bird and it wants to go where there aint no readers That's the truth: they go and paw a place all up and spoil it for me. It isn't my secret anymore. We come and go, but the land is always here. And the people who love it and understand it are the people who own it — for a little while. Alexandra drew her shawl closer about her and stood leaning against the frame of the mill, looking at the stars which glittered so keenly through the frosty autumn air. She always loved to watch them, to think of their vastness and distance, and of their ordered march. It fortified her to reflect upon the great operations of nature, and when she thought of the law that lay behind them, she felt a sense of personal security. She had never known before how much the country meant to her. The chirping of the insects in the long grass had been like the sweetest music. She had felt as if her heart were hiding down there, somewhere, with the quail and the plover and all the little wild things that crooned or buzzed in the sun. Under the long shaggy ridges, she felt the future stirring. Freedom so often means that one isn't needed anywhere. Here you are an individual, you have a background of your own, you would be missed. But off there in the cities there are thousands of rolling stones like me. We are all alike; we have no ties, we know nobody, we own nothing. When one of us dies, they scarcely know where to bury him... We have no house, no place, no people of our own. We live in the streets, in the parks, in the theatres. We sit in restaurants and concert halls and look about at the hundreds of our own kind and shudder. Part IV, Chapter 1 : "The White Mulberry Tree"
I tell you there is no such thing as creative hate! Nothing is far and nothing is near, if one desires. The world is little, people are little, human life is little. There is only one big thing — desire. The great pines stand at a considerable distance from each other. Each tree grows alone, murmurs alone, thinks alone. They do not intrude upon each other. The Navajos are not much in the habit of giving or of asking help. Their language is not a communicative one, and they never attempt an interchange of personality in speech. Over their forests there is the same inexorable reserve. Each tree has its exalted power to bear. Sometimes paraphrased: What was any art but a mould in which to imprison for a moment the shining elusive element which is life itself — life hurrying past us and running away, too strong to stop, too sweet to lose. I keep my mind on it. That's the whole trick, in so far as stage experience goes; keeping right there every second. If I think of anything else for a flash, I'm gone, done for. But at the same time, one can take things in — with another part of your brain, maybe. It's different from what you get in study, more practical and conclusive. There are some things you learn best in calm, and some in storm. You learn the delivery of a part only before an audience. I ain't got time to learn. I can work like mans now. On starlight nights I used to pace up and down those long, cold streets, scowling at the little, sleeping houses on either side, with their storm-windows and covered back porches. They were flimsy shelters, most of them poorly built of light wood, with spindle porch-posts horribly mutilated by the turning-lathe. Yet for all their frailness, how much jealousy and envy and unhappiness some of them managed to contain! The life that went on in them seemed to me made up of evasions and negations; shifts to save cooking, to save washing and cleaning, devices to propitiate the tongue of gossip. This guarded mode of existence was like living under a tyranny. People's speech, their voices, their very glances, became furtive and repressed. Every individual taste, every natural appetite, was bridled by caution. The people asleep in those houses, I thought, tried to live like the mice in their own kitchens; to make no noise, to leave no trace, to slip over the surface of things in the dark. There were no clouds, the sun was going down in a limpid, gold-washed sky. Just as the lower edge of the red disk rested on the high fields against the horizon, a great black figure suddenly appeared on the face of the sun. We sprang to our feet, straining our eyes toward it. In a moment we realized what it was. On some upland farm, a plough had been left standing in the field. The sun was sinking just behind it. Magnified across the distance by the horizontal light, it stood out against the sun, was exactly contained within the circle of the disk; the handles, the tongue, the share — black against the molten red. There it was, heroic in size, a picture writing on the sun. "Jim," she said earnestly, "if I was put down there in the middle of the night, I could find my way all over that little town; and along the river to the next town, where my grandmother lived. My feet remember all the little paths through the woods, and where the big roots stick out to trip you. I ain't never forgot my own country." She remembered home as a place where there were always too many children, a cross man and work piling up around a sick woman. The windy springs and the blazing summers, one after another, had enriched and mellowed that flat tableland; all the human effort that had gone into it was coming back in long, sweeping lines of fertility. The changes seemed beautiful and harmonious to me; it was like watching the growth of a great man or of a great idea. I recognized every tree and sandbank and rugged draw. I found that I remembered the conformation of the land as one remembers the modelling of human faces. I think of you more often than of anyone else in this part of the world. I'd have liked to have you for a sweetheart, or a wife, or my mother or my sister — anything that a woman can be to a man. The idea of you is a part of my mind; you influence my likes and dislikes, all my tastes, hundreds of times when I don't realize it. You really are a part of me. Ain't it wonderful, Jim, how much people can mean to each other? As I confronted her, the changes grew less apparent to me, her identity stronger. She was there, in the full vigour of her personality, battered but not diminished, looking at me, speaking to me in the husky, breathy voice I remembered so well. His misfortune was that he loved youth — he was weak to it, it kindled him. If there was one eager eye, one doubting, critical mind, one lively curiosity in a whole lecture-room full of commonplace boys and girls, he was its servant. That ardour could command him. It hadn't worn out with years, this responsiveness, any more than the magnetic currents wear out; it had nothing to do with Time. The great fact in life, the always possible escape from dullness, was the lake. The sun rose out of it, the day began there; it was like an open door that nobody could shut. The land and all its dreariness could never close in on you. You had only to look at the lake, and you knew you would soon be free. To people off alone, as we were, there is something stirring about finding evidences of human labour and care in the soil of an empty country. It comes to you as a sort of message, makes you feel differently about the ground you walk over every day. He had never learned to live without delight. And he would have to learn to, just as, in a Prohibition country, he supposed he would have to learn to live without sherry. Theoretically he knew that life is possible, maybe even pleasant, without joy, without passionate griefs. But it had never occurred to him that he might have to live like that. "In great misfortunes," he told himself, "people want to be alone. They have a right to be. And the misfortunes that occur within one are the greatest. Surely the saddest thing in the world is falling out of love — if once one has ever fallen in." Falling out, for him, seemed to mean falling out of all domestic and social relations, out of his place in the human family, indeed. Even in harmonious families there is this double life: the group life, which is the one we can observe in our neighbour's household, and, underneath, another — secret and passionate and intense — which is the real life that stamps the faces and gives character to the voices of our friends. Always in his mind each member of these social units is escaping, running away, trying to break the net which circumstances and his own affections have woven about him. One realizes that human relationships are the tragic necessity of human life; that they can never be wholly satisfactory, that every ego is half the time greedily seeking them, and half the time pulling away from them. In those simple relationships of loving husband and wife, affectionate sisters, children and grandmother, there are innumerable shades of sweetness and anguish which make up the pattern of our lives day by day, though they are not down in the list of subjects from which the conventional novelist works. Now everything was in ruins. The air was still and cold like the air in a refrigerating-room. What I felt was fear; I was afraid to look or speak or move. Everything about me seemed evil. When kindness has left people, even for a few moments, we become afraid of them, as if their reason had left them. When it has left a place where we have always found it, it is like shipwreck; we drop from security into something malevolent and bottomless. Only the stupid and the phlegmatic should teach. People can be lovers and enemies at the same time, you know. We were... A man and woman draw apart from that long embrace, and see what they have done to each other... In age we lose everything; even the power to love. In other searchings it might be the object of the quest that brought satisfaction, or it might be something incidental that one got on the way; but in religion, desire was fulfilment, it was the seeking itself that rewarded. I could bear to suffer... so many have suffered. But why must it be like this? I have not deserved it. I have been true in friendship; I have faithfully nursed others in sickness... Why must I die like this, alone with my mortal enemy? Elsewhere the sky is the roof of the world; but here the earth was the floor of the sky. The landscape one longed for when one was away, the thing all about one, the world one actually lived in, was the sky, the sky! Father Latour judged that, just as it was the white man's way to assert himself in any landscape, to change it, make it over a little (at least to leave some mark of memorial of his sojourn), it was the Indian's way to pass through a country without disturbing anything; to pass and leave no trace, like fish through the water, or birds through the air. It was the Indian manner to vanish into the landscape, not to stand out against it. The Hopi villages that were set upon rock mesas were made to look like the rock on which they sat, were imperceptible at a distance. The higher processes are all processes of simplification. The novelist must learn to write, and then he must unlearn it; just as the modern painter learns to draw, and then learns when utterly to disregard his accomplishment, when to subordinate it to a higher and truer effect. One might say that every fine story must leave in the mind of the sensitive reader an intangible residuum of pleasure; a cadence, a quality of voice that is exclusively the writer's own, individual, unique. A quality which one can remember without the volume at hand, can experience over and over again in the mind but can never absolutely define, as one can experience in memory a melody, or the summer perfume of a garden... It is a common fallacy that a writer, if he is talented enough, can achieve this poignant quality by improving upon his subject-matter, by using his "imagination" upon it and twisting it to suit his purpose. The truth is that by such a process (which is not imaginative at all!) he can at best produce only a brilliant sham, which, like a badly built and pretentious house, looks poor and shabby after a few years. If he achieves anything noble, anything enduring, it must be by giving himself absolutely to his material. And this gift of sympathy is his great gift; is the fine thing in him that alone can make his work fine. The artist spends a lifetime in pursuing the things that haunt him, in having his mind "teased" by them, in trying to get these conceptions down on paper exactly as they are to him and not in conventional poses supposed to reveal their character; trying this method and that, as a painter tries different lightings and different attitudes with his subject to catch the one that presents it more suggestively than any other. And at the end of a lifetime he emerges with much that is more or less happy experimenting, and comparatively little that is the very flower of himself and his genius. The "sayings" of a community, its proverbs, are its characteristic comment upon life; they imply its history, suggest its attitude toward the world and its way of accepting life. Such an idiom makes the finest language any writer can have; and he can never get it with a notebook. He himself must be able to think and feel in that speech — it is a gift from heart to heart. Ch. 12 (6 September 1902) near Marseilles, France. What a thing it is to lie there all day in the fine breeze, with the pine needles dropping on one, only to return to the hotel at night so hungry that the dinner, however homely, is a fete, and the menu finer reading than the best poetry in the world! Yet we are to leave all this for the glare and blaze of Nice and Monte Carlo; which is proof enough that one cannot become really acclimated to happiness. (10 September 1902) in the village of Cavalaire, France. I am sure I do not know why the beauty of Monte Carlo should not satisfy more than it does. The bluest of all seas is nowhere bluer than when you see it between the marble balustrades of the long white terrace before the casino, palms are nowhere greener than in that high garden which the mountain screen from every unkind breath, no colours could be more rich and various than those of the red and purple Alps that tower up behind the town, on whose summit such violent thunderstorms gather and break. But for me, at least, there was not at all the pleasure I had anticipated in this dazzling white and blue, these feathery palms and ragged Alps. ...I had a continual restless feeling that there was nothing at all real about Monte Carlo; that the sea was too blue to be wet, the casino too white to be anything but pasteboard, and that from their very greenness the palms must be cotton. … in atmosphere and spirit the entire kingdom of Monaco is an extension of the casino. 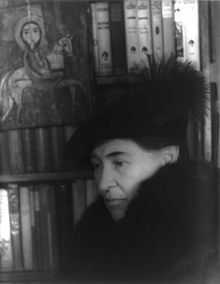 The most sensuous of writers, Willa Cather builds her imagined world almost as solidly as our five senses build the universe around us. Rebecca West, "The Classic Artist", in James Schroeter, (ed.) Willa Cather and Her Critics, Cornell University Press, 1976.